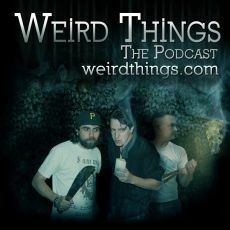 Justin Robert Young, Andrew Mayne, and Brian Brushwood host the Weird Things podcast. The podcast is mostly free form discussion of the latest weird news stories. Common topics are aliens, time-travel, superpowers, cannibalism, and futuristic technology. Weird Things officially opened to the Patreon platform for fan funding on October 26, 2014. It distributed episodes for two months before Justin realized that they weren't charging patrons for episodes. This was largely attributed to the fact that none of the guys have ever been in charge of actually publishing episodes to any of their Patreon shows. Since then, Bryce was brought on to produce the show and Patreon. Before the show, Andrew prepares a list of news stories or listener-created scenarios for Brian and Justin to ponder. These stories range from major advances in science to a zombie apocalypse. Often, this involves the three of them having assigned roles and humorously acting out the scenario as Andrew slowly reveals more and more information about the usually horrific scenario. In most episodes there are 3-4 topics followed by the hosts recommending books, TV shows, movies etc. for the listening audience. Staring with their 19th episode, they began accepting listener advertisements for their show. There were three ad reads per show where, for the low price of $30, Justin will say anything that the listener wants, in any voice they want. With the launch of the Patreon campaign, the show no longer takes user sponsor reads. After doing so many episodes, the guys are bound to repeat themselves. Here are some minor things that have appeared in multiple episodes (some are stranger than others). James Cameron says that putting humans in space is very important, while Carl Sagan argued that putting robots in space will get you much more scientific data for the same price. "I'm so 3008, you're so 2000 and late" (Reference to a Black Eyed Peas song) from The Kraken Awakes! and Nazi Petting Zoo. "We will not go quietly into the night! We will not go down without a fight!" This page was last modified on 6 March 2015, at 14:31.